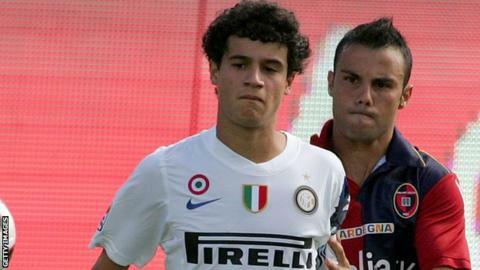 Liverpool have agreed an £8.5m deal for Inter Milan's Brazilian midfielder Philippe Coutinho. The 20-year-old is expected to travel to Merseyside early next week for a medical and Liverpool will need to apply for a work permit before the deal can be completed. Liverpool had two bids turned down for him last week, while Southampton are also interested in signing the player. But it is understood that Coutinho expressed a preference for Anfield. He came through Vasco da Gama's youth system and was bought by Italian Serie A giants Internazionale in 2008, at the age of 16, for €4 million. He linked up with the club on his 18 birthday. That is despite having worked with new Saints manager Mauricio Pochettino, while on loan at Espanyol last season. Liverpool manager Brendan Rodgers revealed on Friday that he was determined to bolster his squad with more new players before the transfer window closes at the end of January. Midfielder Tom Ince, who came through the ranks at Anfield before being sold to Blackpool remains on his radar. Rodgers said: "We still need one or two additions. The club is doing everything it possibly can to assist me. "The real plans are for now. Short term we want to improve and develop. We have brought in Daniel [Sturridge] and he has been brilliant. If we can bring in one or two more, then great. If not the group has worked fantastically well and if we can support it now, then fantastic. It is very much about the now, we want to improve." Having lost out on signing Clint Dempsey on deadline day in August, Rodgers insists there are no such problems this time around. "The owners have been brilliant in supporting me," he added. "We were maybe a little bit short in the summer, but we all agreed this was a month that we would try and strengthen. "It was difficult all around in the summer. I was a new manager, we didn't have recruitment staff, I was busy in pre-season and the lines of communication maybe weren't there. "But from that moment on, we got the recruitment team in, the lines of communication are very clear, every knows where they are at - there is a small group of us who communicate a lot and look at the players we want to bring in. It has worked very, very well and that relationship will only get better going forward. We are all very happy. " Liverpool travel to Oldham in the FA Cup on Sunday and Rodgers says the chance to win the trophy remains as much a priority as a top-four finish. "We want to progress in the league and get into those top four positions," he stated. "It is going to be immensely difficult to get there this season but we are certainly going to fight in order to get there. The Cup competitions give you that opportunity to get your hands on a trophy and that's what this club is about." Having admitted a top-four finish is an uphill battle, Rodgers went on to say that the future of Luis Suarez did not entirely depend on the club securing Champions League football next season. "Luis had a terrific season last season and he had an opportunity to leave, and probably would have had an excuse with a new manager coming in, but he didn't. He committed to the club," Rodgers said. "He sees the vision going forward, and he believes in that. He knows it won't happen overnight. He has had a brilliant season with 20 goals until now, and hopefully there are many more to come." Liverpool goalkeeper Pepe Reina has not overcome a thigh problem in time to play in the FA Cup tie, but both Sturridge and Suarez will travel with the squad.